The Grand Canyon is a vast place and as a result hosts a large variety of animals within her boundaries, including several species that are native. The California Condor - The Grand Canyon is a safe haven for endangered species, such as the California Condor, to live and attempt to save themselves from extinction. The California Condor, a magnificent bird, with a wing span of almost ten feet, is living in the Grand Canyon. Even with the effort of the last years to revive this species there are few birds living. The California Condor has been listed as an endangered species since 1967. Reintroduction of the birds in Arizona began in 1996. Condor #305 was the first wild hatched condor in Arizona in the last century. In 2005, nearly 250 condors were living both in the wild and in captivity. 45 of the birds were in Arizona, including three new chicks, but only one of the chicks were at the Grand Canyon. Kaibab Squirrel - The Kaibab squirrel is a subspecies of the Abert's squirrel, which is found on the South Rim of the Grand Canyon. The Kaibab squirrel prefers high elevation and ponderosa pine forests and is unique to the North Rim of the Grand Canyon and as such, this subspecies is not found anywhere else in the world. The mammal makes its home out of twigs and pine needles, and they eat fungi, fruit and acorns, seeds, bark and the twigs of trees. 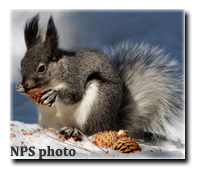 The ponderosa pine trees are home to these little creatures, and the animal enjoys the seed of the pine cones. The desert bighorn sheep the occupy the Grand Canyon were common at one time, but no longer. Their population has been severely impacted by man, but those threats are far less within the confines of the National Park. These creatures are magnificent and regal and a landmark of many photographs of the Grand Canyon. The juvenile is able to walk and climb well within days of being born, but this does not save them from having a high mortality rate. They are likely to succumb as prey and are less able to fend of disease. The habit of bighorn to spend time along cliff walls keeps them safer from most prey, but not mountain lions. Life on a cliff wall is never sure, and on occasion the sure footed bighorn do fall. The horns of the bighorn sheep continue to grow throughout their lives and are not shed. The males horns grow to a full curl and the females are only a half curl. The Bighorn are herbivores and feed on grasses and other flora in the park. Tanya Milligan with a common kingsnake. Reptiles - Reptiles are common in the desert. The environment supports interesting reptiles such as the gila monster, chuckwalla and the common king snake. A chuckwalla is a large lizard with loose folds of skin around its upper body and is active by day. When this animal is threatened it will retreat to a narrow crevice and wedge itself between the sides, gulping air and pumping itself up as a form of protection. The Gila monster is another lizard that is active during the day. It is the largest and the only venomous lizard in the United States. It ranges, in length, from eighteen to twenty-four inches. The venom of the Gila monster is painful but it rarely causes death. The common kingsnake is a black snake with white bands This snake will bite other snakes and lizards behind the head then coil around them. 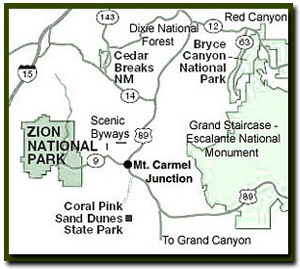 Directions to the Grand Canyon North Rim - From Zion National Park, travel SR-9 to Mt. Carmel Jct., then turn south on US-89 to Kanab. There is only one stop light in Kanab; this is where US-89 changes to SR-89A. Fredonia, Arizona is just a few miles away, across the Utah - Arizona border. Take SR-89A to Jacob lake (36 miles), then take SR-67 to the Grand Canyon North Rim park entrance.